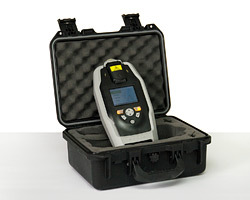 The Ahura FirstDefender is a Raman based handheld detection device with the ability to maintain sample integrity. KD offers integrated training for this detection instrument focusing on how the FirstDefender compliments other fielded chemical detection equipment. KD Analytical provides training for the Ahura FirstDefender as part of our Integrated Survey Course. KD Analytical Maintenance Management is a suite of services that can save you money and time while helping to guarantee the readiness of your Ahura FirstDefender and many other analytical instruments. One-call, 24x7x365 technical support for Ahura FirstDefender and all of your instruments, regardless of manufacturer. Our analytical instrument experts can help you perform user-level maintenance by phone, web or email. ReadiTrak web-based asset readiness manager tracks instrument status, preventative maintenance, repair history, and maintenance costs of your FirstDefender and virtually any other gear your count on to do your job. When your Ahura instrument needs an expert repair, KD Analytical will oversee repairs performed by the OEM.